César Manrique (1919-1992) was the local lad who made good. The island will forever be indebted to this man who turned a volcanic rock into an isle of wonders, ensured its hotels or other accommodation never became towering concrete monstrosities, and added tourist interest to what, otherwise, might have offered little but sun an barren, razor-edged rock. After leaving the island to live in such places as New York, Paris and Madrid, becoming an acclaimed modern artist, and mixing with the likes of Picasso and Miró, he returned to his island home in 1968 to a hero's welcome. Being 'worldly wise', he could see what the new phenomenon of tourism could do to damage or assist his island, and after putting forth his ideas to ensure their local culture was not threatened, the local council gave him a free hand to do what ever he wanted on the island. He banned all roadside billboards, laid down strict architectural rules (including prohibiting high-rise buildings and insisting that window shutters must be natural colour or green, with blue allowed if near the sea). He also turned some of the island's more unusual natural features into amazing tourist attractions. Manrique's talent was the blending of modern art with Nature. He knew that the harsh lines and stark colours of this volcanic island lent themselves very well to his vivid artistic interpretations, and he proved it with creations such as Jameos del Agua and his own home: both a taming of volcanic tunnels! He was also deeply into mobiles, and some giant wind-driven creations are to be found on the island. Sadly he died in a car accident near his home. I doubt if anyone other than a ruler or dictator has made such a lasting impression on his homeland. 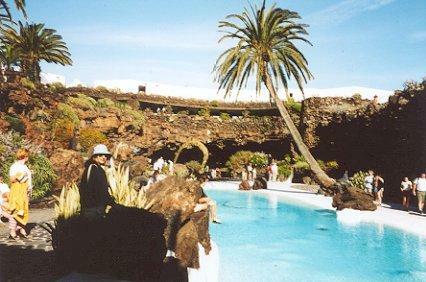 Now the César Manrique Foundation provides a lasting memorial to his work, utilizing his own amazing home. Let's get one myth out of the way fast. Don't waste your time looking for canaries on these islands! They get their name from a wild dog, not a bird. Why? The Latin canis means dog. A white-pawed decedent still survives. Rock inside the earth is a boiling liquid called magma. Where the surface crust is weak or broken, magma sometimes forces its way out through hollows called pipes. 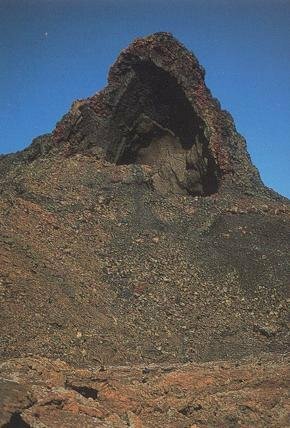 The liquid bursts out as solids, liquids and gasses and builds deposits into a volcanic cone. Eruptions can also break out a volcano's sides or blow through underground tunnels. Fast flows finally cool into a smooth, shingle-like substance. Slow-moving rivers of magma end up like overflowing icing, bulked up against itself in waves. Of course, I never actually wanted to go to Lanzarote. Why should I? I am not a sun-worshipper, I knew it would be a barren rock and I'd already seen the extremes of Nature in Iceland. Anyway, who would want to visit the place sometimes dubbed 'Land-so-grotty' (where 'grotty' is a less than polite English synonym for 'horrible'). Yet I went, because H wanted to go, and it was her turn to choose - again. She, you see, quite likes the sun. To be fair, I'd better admit right here, in case you don't read on and I do the place a great injustice, there is a lot more to Lanzarote than meets the eye - or any preconceived notions. When you arrive, what does meet the eye is admittedly essentially a monochrome landscape - almost sepia at times, as this colour picture confirms. Yet there is a certain beauty when the black-and-white landscape is set in juxtaposition with bougainvillea or its colourful like. It has to be said that when the inhabitants of Lanzarote want to grow shrubs they need to work at it, but once they have, the stark beauty of contrast between it and the dark, gravel-like volcanic substance needed to nurture it is a pleasure to the eye. "On the first day of September 1730, between nine and ten at night, the earth suddenly opened close to Timanfaya, two leagues from Yaiza. During the first night an enormous mountain rose up from the bowels of the earth, with flames shooting from its summit, which continued burning for 19 days." A later entry tells us: "On 18th October three new openings formed above Santa Catalina from which dense smoke emerged, which scattered over the entire island. The explosions which accompanied this phenomena, the darkness caused by its mass of grains and the smoke which covered the island, forced the inhabitants of Yaiza to flee their homes." Do you wonder at that? I think I might have been inspired to lead the way. The Sunday Teguise Market - when even the islanders get so excited they forget about their siesta, and this is the only place the busses see fit to go. Anyway, who has time for a siesta when it's not a working day? Come on, this is Spain, really. I stayed in what I think is probably one of the best tourist areas: Puerto del Carmen, the island's main resort, which includes 5 km of sandy beaches in stark contrast to the volcanic ash to be found most everywhere else. This coastal strip contains an endless string of bars, restaurants and gift shops. You won't have a problem finding somewhere to eat - even if the menus are amazingly similar and unspectacular. While César Manrique's preoccupation with keeping to traditional white, single-storey dwellings is less evident in tourist resorts (did you not read the coloured panel above? ), Puerto del Carmen does try to keep to the spirit of this. (In fact, over the entire island, the only place you will find a high-rise building is on the waterfront of the capital, Arrecife, and this monstrosity - still under construction when I saw it in 2003 - is the thing islanders would most like to see demolished. Certainly Manrique would turn in his grave at the knowledge of it.) Actually, I stayed just along the way from Puerto in an area called Playa de los Pocillos, in an apartment complex named Lanzarote Village, where the nearby beach was as black as Lanzarote can make them. This complex comprised a basic hotel building overlooking the sea with its own pool area, plus an enormous cluster of apartments surrounding the pool rather like the honey combs produced by a swarm of dysfunctional bees. This is evinced by the hotel plan near reception that attempts to show apartment locations, for although you might be able to locate an apartment number upon it, finding it in the real world is quite another thing. Nearby is a fine model of the hotel in a glass case, showing its open-air theatre boasting copious seating, and you might imagine this would help if the plan leaves you entirely baffled. If I tell you there is really a tennis court where this open-air theatre is shown, and entertainment takes place in a small space in the bar, you will begin to realize it might not help too much - and that your expectations need to be scaled-down, somewhat. If you do stay here, the normal rules of sunbed engagement do apply. The German contingent of the First Towel Brigade habitually carry out early morning raids on sunbeds, claiming strategic territory at dawn, employing scantily clad forays. By 07:00 hrs all the comfortable sunbeds have been claimed, in another couple of hours all the uncomfortable ones have been claimed, then a prolonged period of serious body-toasting ensues until 18:30 hrs, when minds turn to new rules of engagement at the excellent buffet. You need to adjust yourself to the elbow-to-elbow combat over a few days before you can perform well here - or go late and be laid-back: rather than knocked-back Service here is so ruthlessly efficient that plates or cutlery are whisked away while you have barely taken breath between courses, so anchor them down with super-glue or leave a lookout at the table before you head out for more food. Within a week you should have mastered all this well enough to feed quite well. Similar apartment hotels abound in Lanzarote. We had half-board and the kitchenette was therefore merely a means of making a quick snack. The notion of apartments clustering around communal gardens and a pool is also a formula that seems to work well in some residential areas where the occupants turn their back on the roads and look inward to their own little world of sun. Which brings me to a related point. For how long should you go to Lanzarote? Consider what there is to do, first. There is the North Tour or sunbathing. There is the South Tour or sunbathing. There is the Gran Tour or sunbathing. There is the Sunday Market (rather similar each Sunday) or sunbathing. There is the capital, Arrecife (not a great attraction, it has to be said). Then, of course, there is always sunbathing. Except during the winter months, December to February, rain is pretty much unusual and you can be sure of - guess what - sunbathing. So the bottom line is this: how much do you like sunbathing? To be brutally honest, there is nothing of the architectural interest to be found in much of Europe, and while the simple building style on Lanzarote has kept it from being overcome by the concrete jungles that invade many tourist resorts, there is much of a sameness about stereotype white housing. So why not bring a large container of suntan lotion - but remember to do both North and South Tours (or the Gran Tour) in order to see what Lanzarote is really about. Now while I am not inclined to be a sunbather - I normally recline - when in Rome, as they say. I might not rate lying in the sun for days-on-end very highly but, hey, how could I return to England without a tan to prove I'd been somewhere? So I made a master-plan one night and subsequently shot out at dawn with towels to reserve a couple of comfortable sunbeds. A distant cry of "Yes!" was later explained to me by the female half of one of the few other English couples there who had spotted my tactical move and was giving me moral support from afar. Actually I managed this twice in a week, so we reserved our fair share of sun. Not that you need reserve sun itself of course: it is not in short supply in Lanzarote. Did I mention that before? One thing this island does lack - which to me is a great advantage - is the means of attracting the lager-lout. So if you want the sun and peace-and-quite, then Lanzarote might be just the ticket! Teguise is the old capital of the island although, today, it is barely more than a village. Early islanders chose to live in this elevated position so that they could look out for slave traders and pirates. It gave them the chance to flee to the volcanic caves in the north where the could hide. It contains the island's most elegant buildings and has the most atmosphere although, its transformation into a giant and sprawling market on the one day a week that it truly vibrates makes it a place of contrasts. Do go, if you like to haggle. There is not a a great deal to see when this town is quiet - and it impossible to see when it is not quiet. 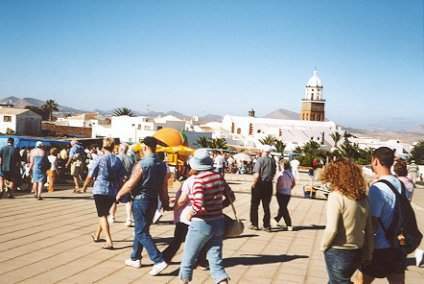 Locals, however, still regard this as the island's true capital and relegate Arrecife to port and shopping status. Teguise was a town that knew nobility and gave birth to much of the Canarian folk culture, including its unique instrument, the timple. (England, by the way, has a similar culture, having given birth to the tipple: music to many ears.) The main square is marked by an ancient, white-capped church, Iglesia de Nuestra Señora de Guadalupe; thankfully it is also known as San Miguel! Teguise is certainly worth a visit and, because transportation on this island is very much focussed on the need of the locals as opposed to the visitor, a Sunday visit is perhaps the most practical. It is easy, enough, after all, to flee from the hubbub of the market stalls and enter a cool sanctuary for a drink or snack: the way to find true character-building. Try the local wine, for example, and wonder at how they ever grow vines here. As for food, you'd be surprised how the traditional 'English breakfast' of bacon, egg and all things cholesterol, has infiltrated into the farthest reaches of the eating establishments on this island. Who said the UK doesn't export much these days? Arrecife is the modern capital and port. This is where half the inhabitants live and work and the place where the most comprehensive shops are to be found - although, don't raise your expectations too high, dear shopaholics. Paying no attention to the tourist, the capital is strictly functional, although the harbour does offer quite a pleasant aspect. At the heart of the town is San Ginés Church, worth a visit for those to whom such things as atmosphere, religion or peace appeal. Being the capital, this is where most of the busses terminate and stem from, but be aware that the timing of such busses is much more concerned with how villagers might wish to get to and from work than how you, the tourist, might rattle around the island. Apart from this and taxis for short distances, the organized tours or hire cars offer the best means of transport. A clue as to the nature and ethic of the native people can be had from the bus timetables that have three different modes: workdays, Sundays and festivals. Está bien! 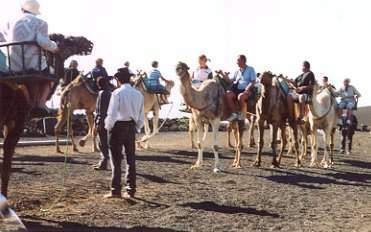 Why it is that H so likes camel rides I cannot imagine, but her delight was unbounded when she learned that our tour to the Timafaya National Park actually included one. As usual, the camels took an inordinate interest in their passengers, all dangly bits (of clothing) had to be kept well out of the way of their munching mouths, and the rocking motion was punctuated by the lurching acts of their initial standing and terminal kneeling. Do be circumspect about what you eat the morning before: preferably not a full-English breakfast. Also watch where you tread nearby this staging post, or you may have a fragrant reminder of the trip all day. These camels are owned by different families who breed them for just this purpose. (Riding, that is, not fragrance.) In fact, the camel has a long-standing (and far-lurching) genealogy on this island. This turbulent adventure takes you between the volcanic cinder and allows you can look both up to the mountains of lava and down to a spent volcano core that helped mould some of this moon-like scenario. Incongruously a warden was raking the fine black material on a mountainside. Must keep things in order, I suppose. Visually there are basically two forms of lava: the soft, smooth, gravel-like material that tells of smooth, fast flowing lava, and the whipped-up, dark, razor-edged terrain that is the aftermath of slow pushing, spreading and cooling, the stuff that could reduce your trainers to shreds in minutes should you recklessly choose to walk upon it. Not that you are allowed to, for strict controls ensure tourists do not avail themselves of such dangerous pastimes. At the lowest level, the first demonstration consists of a ranger shovelling up some of the gravel-like substance and offering it for you to hold in order to check-out its heat. His anticipatory grin is not for nothing. Be prepared to drop it if you're one of the first in the queue, for these 'hotlands' near this dozing volcano do get rather warm! A little higher than this there is a volcanic vent into which a ranger will drop some dry wooden material that very quickly bursts into smoke and flame due to the much greater heat a metre or so down. Up another level and you are given the steam demonstration. 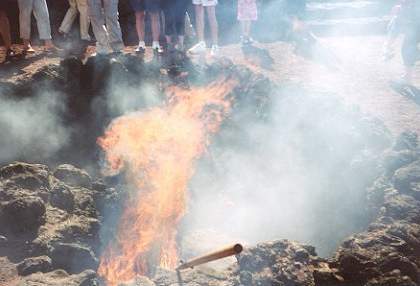 Here a ranger pours a bucket-full of water down a pipe into a volcano's vent. It instantly and angrily boils it and blows it back as a cloud of roaring steam! And if this series of demonstrations fails to convince you this volcano is still bubbling away between your feet, awaiting its next moment of greatness, ascend to the bee-hive like structure next to the entrance of the restaurant and go into the area where volcanic cooking takes place. But take care. The circular griddle, around 2 metres in diameter, covers a hole down into the depths of a volcanic tunnel, and the hot air in this vent can and does cook: so watch it doesn't cook your face or hands. You won't be wanting to hold your hand over this hole for too long, I can assure you! On the way down this volcanic mountain you will pass a fine example of a collapsed volcanic cone, and will have the opportunity to marvel at the lunar-style landscape, including the awesome, smooth surface of the Valley of Tranquility: not so tranquil during the days its molten lava blanketed several villages and the very best agricultural land. Today a few tufts of grey grasses seek to find nourishment and lodging, a hint of what future greenery might one day take hold: if Nature - and Fire Mountain - give it a chance. 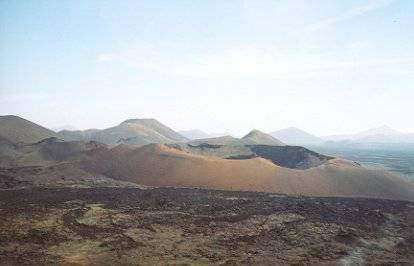 The extremes of Nature are very evident on Lanzarote, and another unusual place is El Golfo (The Gulf), which is the result of a meeting between the blackened volcanic devastation of Timafaya and the power of Atlantic waves. Here you can see a half-submerged volcano where volcanic minerals and algae have given the water the strange hue you can see in the picture that has all the bathing appeal of a bath of acid. There is no lack of water around Lanzarote - it's called the Atlantic - and the island extracts considerable salt from this free resource in salt-beds not far from El Golfo. This is just along the spectacular coast, where vigorous waves are surprised and heart-broken to find a shore prior to the African continent. Indeed, if you look closely, you can even see their frothing anger from the top of Fire Mountain. More fundamental than this is the way islanders have adapted to grow crops - or anything, come to that. There is no natural soil, nor is there any water other than the sea. Consequently, all drinking water (and I suggest you don't) comes from this source via a desalination plant. Try bottled water - agua mineral, either still (sin gaz) or carbonated (con gaz) instead, and leave the salt to be harvested. The real marvel is how the black volcanic material is used rather in the way of a mulch to both provide moisture and minerals to plants. The humid breezes that flirt with the island deliver moisture into this material and it stores it for potential use by plants. (Brilliant! Who thought of that one? Manrique?) 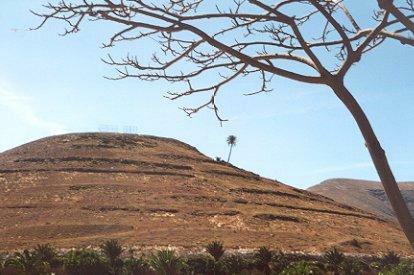 Yet it is still not easy to grow vines, for example, on the desolate wastes that make up the best potential agricultural areas because of the very same wind. 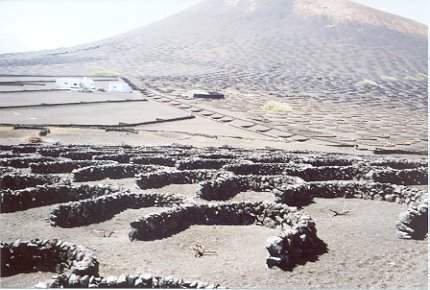 But by the use of half-ringed walls, labour-intensively built around individual vines, heat build-up and shelter is created, as shown in the picture. Incredibly, this can be very efficient, most years. But even more incredible is the way the islanders farm cochineal for red dye that has a worldwide demand. (Like it or not, you've definitely eaten it!) These insects - really a plague - are raised on host cacti and are picked off by hand. So the next time you think you have a tough assignment, give a thought to the prickly and hot job of the cochineal pickers before you grumble. I should imagine they really do earn their siesta! 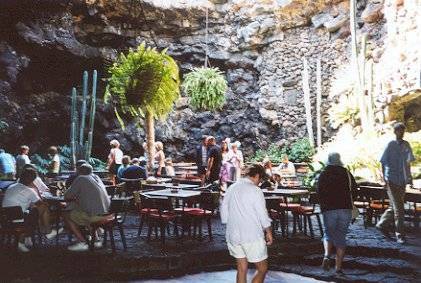 Apart from the Fire Mountains, the most memorable thing on Lanzarote for me was Jameos del Agua, another César Manrique inspiration. Here Manrique moved on from the prototype volcanic cave dwelling that was his home and turned what was little more than a hole in the ground - actually a collapsed volcanic tunnel - into a series of wonders for the eye to behold and the mind to marvel upon. This has to be one of the most interesting underground grottoes in the world and lies to the north of the island at the foot of Monte de la Corona, a volcano that erupted around 3,000 years ago. Jameos means bubbles of lava, and a jameos is formed when a tunnel ceiling collapses, normally when its width exceeds 20 metres of when gases build up and explode. Forming a part of one of the longest known cave sequences, Manrique's creations here follow the volcanic pipe. The agua is provided by pools at two different levels. When you visit you firstly descend a winding wooden staircase to a restaurant complete with dance floor adjacent to a deep, perfectly transparent pool, distantly open to the sky via a greenery-fringed opening to the sky. Strange, miniature, blind white crabs live in this water, but you need to really peer in order to convince yourself they are what they are. Imagine their life in this big pool. "Where's the wife? I'll just shuffle around for a week or two and maybe find her again. If not, what the heck. I've just bumped into a very nice girl. Now, where is she, again?" From here you can climb one of two further series of wooden steps up other levels for you to sit an drink in an environment that must invite elves to be your companions. Around you are tiny, invisible birds chirruping away, happy in their work of spying on visitors. In here, you almost step into a world of fantasy. Finally you climb up to the open-roofed section of a volcanic bubble which contains a large, blue pool surrounded by palm trees and other greenery sitting within a green-rimmed hole in the ground. You just want to dive in - but can't. Adjacent is a cave-like bar. And if all this were not enough, doors lead through to what is undoubtedly the most remarkable auditorium in the world, located in a volcanic cave. Seats descend in terraces down into the bowels of the earth to a distant wooden stage, and Nature provides the completely random rocky walls of this superb acoustic chamber. If you're lucky, classical music will be playing so that you can guess at what a concert must sound like. It will send shivers down your spine. If you're even luckier, you might plan to see a performance there. At the top is the Casa de los Volcanes (House of Volcanoes), a museum featuring volcanic activity. If you want to see all this in another light, at night, when the lighting gives this creation quite a different aspect, visit the night club after dark on Tuesday, Friday or Saturday. Manrique blended modern art with this natural environment by painting contrasting white areas here and there, plus the use of plants and stone to create architectural effects. He knows where to stop and the touches he adds do not spoil what Nature has created: he merely provides subtle enhancement. As, of course, do I, when bringing you this overview of Lanzarote. For there are other places you can visit in cyberspace to find out more. If you enjoyed reading the above article then you will probably also enjoy Egypt by Ed, and The Louvre in Paris, also in Europe, and our latest articles covering the Orinoco Delta, La Mata, Marbella and Beijing.